There is no longer such a thing as common sense. Get over it. So, the clearer you are about your expectations and the clearer you are about what excellence means, the more successful you’re going to be! Most executives, owners and managers that I have met believe good work is obvious. Surprise; It’s not. If you want high performance you’d better define it. And by the way, you’d better be explicit! We’re all being expected to move faster and to make quicker decisions, especially in the restaurant industry. One of the most courageous and effective acts I experience these days is restaurant operators making the conscious decision to slow down, in order to speed up. “Anytime we hear anything smacking of jargon, we hit the pause button,” says Chicago land restaurateur and TED talk speaker, Nick Sarillo. “For us, we stop in our tracks when we hear words like “professional”, “excellent”, “great”, “clean”, “great attitude.” Nick continues, “my teams trained now to stop when ever someone tosses out an adjective or noun as a “truth.” For example, what does “excellent” mean? In any given situation, “excellence” can be something different. Excellence is redefined hundreds of times in our company. That is, we make sure “excellence” is explicit, rather than implicit in each task. "The action it takes to get to specific definitions of excellence, challenging as it is, has created an outcome for us of shared definitions. Ownership attitude develops within our company as “I” statements become “we” statements,” said Sarillo. We actually create common sense by working from multiple definitions to one shared definition. The outcome from the effort of Sarillo and his team is an explicit culture internally. The Bonus? Sarillo has an explicit brand experience, focused both internally for his team and externally for their customers. Instead of team members waiting to be told what to do, each take an active role in actions that improve the guest experience and profitability all at the same time. Notice the difference between figure 1 and figure 2. The outcome I’ve seen at companies that are stuck complaining about the lack of common sense and are struggling with performance is shown in figure 1. 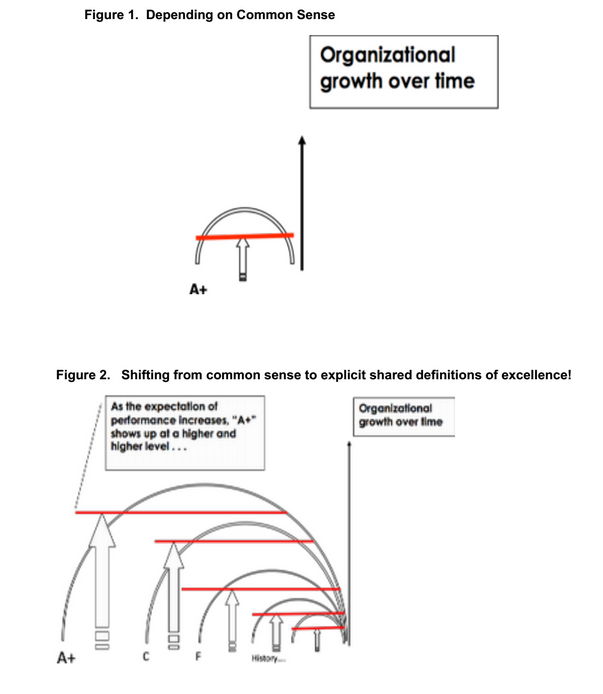 However, Figure 2. shows what will happen if you keep evolving you team's skill sets and clearly define how to achieve excellence. Goethe’s famous quote is one of my favorites. We can turn our dreams into achieved goals. A pitfall of many companies is to think that "if I hire folks with experience in the industry, I don’t really need to train them. They already know what to do." The kiss of death in this thinking that if you end up hiring one person from Chili’s, one from Panera, one from Red Robin and end up with three employees with similar skill sets and experience. The guest easily gets confused with which restaurant they’re in. Instead, regardless of where the team members have worked before, we need to clearly define “our” action steps and the way your restaurant team should perform. Again, this need isn’t always obvious and may not be common sense to everyone. Please note, creating shared definitions of excellence in service, cashiering, bar-tending, managing or any position, is not the same as a job description. Very few people actually go to work hoping to mess up. With shared definitions that are now common– your team is far more likely to move clearly, doing all they can to support your goals. The clearer you are in defining excellence, the more effective their work is going to be.